Ben-Ari and Marzel meet Yishai's Rabbi Mazuz to discuss joint list, as poll shows two parties won't make threshold separately. 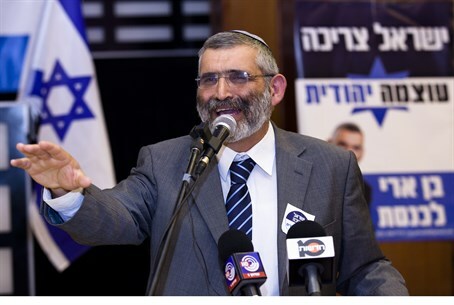 Former MK Dr. Michael Ben-Ari's Otzma Yehudit has held a meeting with the rabbinical counsel of MK Eli Yishai's Yachad - Ha'am Itanu party, reacting to widespread calls for the two religious nationalist parties to run on a joint list. Ben-Ari and activist Baruch Marzel met on Monday in Bnei Brak with Rabbi Meir Mazuz, who serves as Yishai's rabbinical patron, and spoke with him about advancing the idea of a joint campaign for the March 17 elections. Sources familiar with the particulars told Channel 2 that Rabbi Mazuz has been in contact with Marzel for years, and in principle supports a joint list of Otzma Yehudit with Yishai's party. Ben-Ari and Marzel likewise received a blessing from the rabbi in an event last week. So what is holding back a joint list? Reportedly some sources close to Yishai fear that a union with Otzma Yehudit would have their party viewed as "radical," given the extreme portrayal of Ben-Ari in much of Israeli media over his position that Arab residents disloyal to Israel should not be in the country. From Otzma Yehudit's standpoint, some view Yishai as too compromising given that he hopes to join a coalition with Binyamin Netanyahu, although if ideological red lines such as terrorist releases and freezes on Jewish construction (both of which were conducted by the last coalition) were reached, that sticking point may be avoided. Likewise there has been talk of the two parties forming a so-called "technical bloc", by which they could run together and after elections split if they so desired, with each side maintaining their mandates. According to a Tuesday poll, if the two parties ran separately in the upcoming elections Ha'am Itanu would get three seats and Otzma Yehudit would get two, with neither party passing the threshold to enter the Knesset. However, if the two were to run together, the poll found they would receive between four and five seats, and firmly secure a spot in the Knesset. Responding to reports of the meeting with Rabbi Mazuz, Ha'am Itanu played down the meeting: "Rabbi Meir Mazuz meets with all those who ask on every matter and from all sides of the political map. Nothing has changed, the party continues ahead as usual with full power." Otzma Yehudit responded more forthrightly. "As part of preparations for the elections we are holding talks with those who are loyal to the people of Israel so as to create a technical bloc, but if it doesn't happen we will run alone, otherwise our tens of thousands of voters will not come to the ballots (at all)," the party said in a statement.